Author portrait by Sally Jubb Photography. Claire Askew is a poet, writer, creative writing teacher and groupwork facilitator living in Edinburgh, Scotland. Her poetry has appeared in a variety of publications including The Guardian, The Sunday Mail, The Dark Horse, and PANK. Poems of Claire’s have also been selected for inclusion in the Scottish Poetry Library’s annual Best Scottish Poems anthology an amazing three times (2008, 2009 and 2014). Her work has been recognised by numerous awards, including the International Salt Prize for Poetry, the Mslexia Women’s Poetry Competition, the Charles Causley Poetry Competition and the Edwin Morgan Poetry Award. 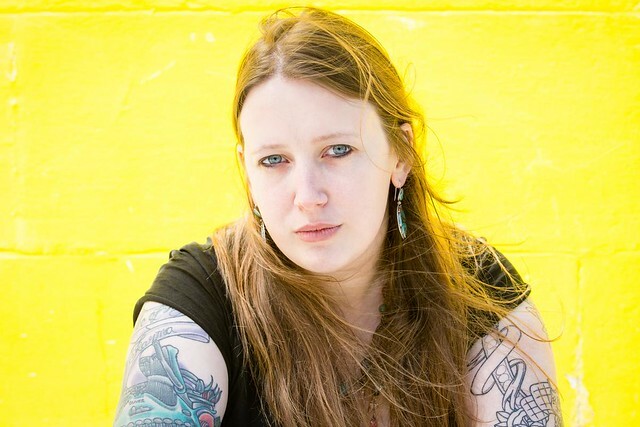 Claire’s debut pamphlet collection, The Mermaid and the Sailors, was published in 2011 by Red Squirrel Press: poems from it won the 2009 William Sharpe Hunter Memorial Scholarship for Creative Writing, and the 2010 Virginia Warbey Poetry Prize. Her first full length collection, This changes things, is forthcoming from Bloodaxe Books in early 2016, and Claire is working on her first novel, Three Rivers (working title), which was longlisted for the Peggy Chapman-Andrews (Bridport) Novel Award in 2014. For a full list of all Claire’s publications, please click here. I currently teach a weekly women’s fiction writing course called Write Like A Grrrl!, designed for women who face barriers that prevent them from living their writing dreams. In the summer of 2016 I helped to deliver the very first #GrrrlCon! — an all-weekend writing and confidence-building gathering for women. If you want to find out more about WLAG!’s activities in Edinburgh, you can email claire@onenightstanzas.com to register your interest. I can also be hired to deliver creative writing courses, or one-off sessions, on poetry, fiction or memoir/personal writing. In the past, I’ve worked with community organisations, libraries, schools, writing groups and book groups, big organisations like The Poetry School… and would love to chat to you about coming to work with you, too. If you’re an individual who wants to brush up their writing (everything from finding inspiration to overcoming writer’s block, to entering contests and getting published), I am happy to offer one-to-one mentoring sessions, too. Email claire@onenightstanzas.com, or read on for information about my rates. I strongly believe that reading, writing and the love of books can and should belong to everyone, and I am especially keen to work with people who face barriers to reading, writing and learning. I’m currently working as a Scottish Book Trust Reading Champion at Craigmillar Library in Edinburgh, with a focus on getting young people aged 12-18 through the door to engage with books, reading, stories, and especially story-based games! You can find out more about how that’s going at my Reading Champion blog. In addition, I have delivered creative writing sessions for homeless and vulnerably housed people, working with organisations including Crisis Skylight Edinburgh and Bethany Christian Trust. In 2014, I worked on Waverley Care‘s Inside/Out: a project designed to empower individuals affected by HIV and/or Hep C to share their personal stories through writing and photography. I have been privileged to work on several writing projects involving asylum seekers, refugees and migrants; working with Refugee Survival Trust; the Scottish Refugee Council; and with the Maryhill Integration Network and Women Supporting Women as part of Making It Home. Lastly, I spent five years at Edinburgh’s Telford College (now Edinburgh College, Granton), and two years at Scottish Book Trust, working with young people and adults who struggle with literacy. I have delivered workshops and interventions in a variety of adult learning settings across Scotland, including the Oban Youth Cafe, Adult Basic Education Bathgate, and the South Ayrshire Youth Forum. I hold a PDA in Adult Education, attained in 2010. Having spent many years working in adult education settings, I’ve become pretty good at putting together fun, engaging learning resources for discussion, group work or solo projects. This year, I created a suite of creative writing resources to accompany Scottish Book Trust‘s public participation campaign, Journeys: they include resources specifically tailored for organisations working with adult learners. Also for Scottish Book Trust, I created and curated a suite of supporting activities to accompany Walk The Walk, a graphic novel for learners aged 16+ on the theme of tackling sectarianism. Elsewhere, I helped to create the Inside/Out project exhibition in collaboration with Waverley Care and photographer Lisa Fleming: this was a week-long exhibition of participants’ writing and photography, shown at the Traverse Theatre as part of Book Week Scotland 2014. I also crowdfunded, and co-edited, Making It Home, the Making It Home project book, which included participants’ writing, photography, drawings, and testimonials. My co-editor on the project was the poet Jane McKie. I love getting out and about to meet people and talk to audiences, whether I’m reading my creative work or giving a talk. I’ve been hired a few times to speak about intersectional feminism, or about inequality in the arts world — most recently, I gave a talk as part of New Scotland: New Culture? at Summerhall, asking the question, who gets to be part of the cultural conversation? I’ve presented research from my PhD in Creative Writing and Contemporary Women’s Poetry at the University of Edinburgh’s The Business conference, at Writers at the Pleasance, and at the Melrose Literary Society. I’ve also spoken and been interviewed about my love of manual typewriters! To date, I’ve appeared in the media on STV News, BBC Radio Wales, BBC Radio Scotland, and in various podcasts, too (see Press for more details). I’m happy to travel all over the place, where expenses allow: if you want me to come and be part of your event, please email claire@onenightstanzas.com! I’ve been commissioned to write poems for all sorts of things, but probably the most exciting was being asked to pen a 16-line poem to accompany the Body Shop Plc‘s fragrance range Dreams Unlimited! My wee poem appeared on every piece of Dreams Unlimited packaging — and on in-store displays — in Body Shop outlets worldwide! I worked closely with the Body Shop Plc’s Copy & Tone of Voice department throughout, travelling back and forth to London where necessary. So really: no job is too big, or too small! Please do get in touch. If you want to hire me, you can get help by applying to Scottish Book Trust’s Live Literature fund: I am on their database of artists, and would encourage you to look into their funding, which covers 50% of author fees and all travel expenses! However, you can also hire me directly by emailing claire@onenightstanzas.com. I am usually happy to meet for a coffee and a chat (or to Skype!) for free, to talk more about your project! My private rates are in line with Scottish Artists’ Union rates of pay, and I am open to negotiations, too! Oh, and lastly, I also run a jewellery store! I believe that no hard-working, self employed girl should be without a reliable side business, so in 2009 I opened Edinburgh Vintage, an online vintage store specialising in jewellery, collectables and small antiques. According to CraftCount, Edinburgh Vintage is one of the Top 15 UK Vintage Sellers on the whole of Etsy! Please do head over and have a browse. Please feel free to get in touch — just drop a line to claire@onenightstanzas.com. For press materials, click here.